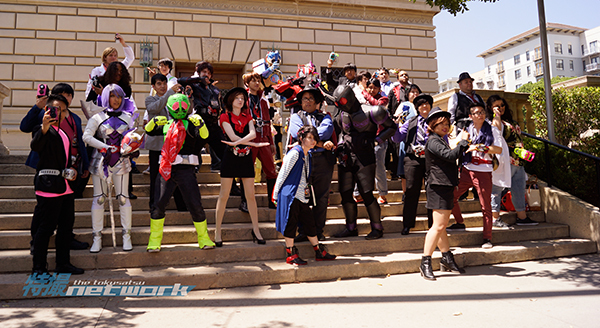 Conventions for Tokusatsu Fans in the U.S.
Tokusatsu has a booming fandom in the U.S. with conventions across the country to celebrate all aspects of the genre. This list breaks down the conventions centered around tokusatsu and the ones that frequently bring tokusatsu guests. G-Fest is a Chicago-based convention celebrating Godzilla and all Kaiju-related works in tokusatsu. With 2018’s convention being its 25th year anniversary, G-Fest often brings wonderful guests such as Shinji Higuchi (Shin Godzilla), Kiyotaka Taguchi (Ultraman X, Ultraman Orb), and more for fans of all ages to enjoy. 2019’s G-Fest convention, G-FEST XXVI, will be held from July 12th to July 14th, at the Crowne Plaza Chicago O’Hare. Japan World Heroes had its first convention in 2017 and is a biannual convention to bring fans of tokusatsu together. Held in Pasadena, California, the convention aims to bring the large world of tokusatsu to fans of the genre. In 2017, their guest list included Renn Kiriyama (Hidari Shotaro in Kamen Rider W), Noboru Kaneko (Kakeru Shishi in Hyakujuu Sentai Gaoranger), and many others. The 2019 convention will be held from August 16th to August 19th, at the Pasadena Convention Center. Power Morphicon is a bi-annual convention that centers around bringing Power Rangers fans of all ages together to celebrate the franchise. With the 2018 convention located in Anaheim, California, it has seen a tremendous guest list such as Jason David Frank (Tommy Oliver in Mighty Morphin’ Power Rangers), Hisashi Sakai (Kou in Gosei Sentai Dairanger), Teruaki Ogawa (Sasuke in Ninja Sentai Kakuranger and Hyuga in Seiju Sentai Gingaman), plus many more. Power Morphicon Express was also recently announced as a way to bring the convention to other areas of the country with more information to be released in the future. Hosted every year in Orlando, Florida, RangerStop is the largest southern Power Rangers convention in the US. Touting reunions from favorite Power Rangers seasons such as Time Force, Wild Force, and more, RangerStop has plenty of guests and panels for any fan to enjoy. Also expanding to further locations, RangerStop & Pop Convention was announced for Atlanta, Georgia on June 21-23, 2019. Every year, Anime Expo brings together the Japanese pop culture industry and fans for a three day celebration in Downtown Los Angeles. With over 100,000 in attendance each year, the convention has had many notable tokusatsu guests such as Go Nagai (Devilman, Cutie Honey, Mazinger Z) and Gen Urobuchi (Kamen Rider Gaim) plus many other tokusatsu voice actors. Anime Expo 2019 will be held July 4th through the 7th. Part of the Supercon convention franchise, Florida Supercon is based in Miami, Florida and has brought several special guests including Bin Furuya (Ultraman suit actor) and Tsutomu Kitagawa (suit actor in several Super Sentai seasons and Godzilla suit actor). 2019’s Florida Supercon will be held from July 4th through the 7th at the Miami Beach Convention Center. Known for as a comic convention in Lexington, Kentucky, Lexington Comic Con often brings Power Rangers guests and has also brought Super Sentai guests such as Yuuta Mochizuki (Geki in Kyoryu Sentai Zyuranger) and Reiko Chiba (Mei in Kyoryu Sentai Zyuranger) in the past. Lexington Comic Con 2019 will be held from March 21st to 24th at the Rupp Arena. Hosted in the Pasadena Convention Center in Pasadena, California, Monsterpalooza celebrates all monster media, including kaiju films. Previous years’ guests include Keita Amemiya (GARO), Mizuho Yoshida (Gamera and Godzilla suit actor), Tsutomu Kitagawa, and much more. 2019’s Monsterpalooza will be held from April 12th to the 14th.